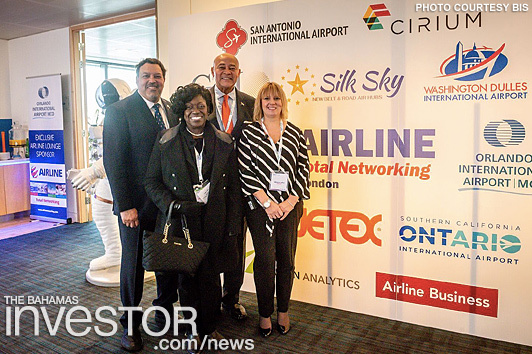 The AIRLINE Networking Conference has a unique format that is designed to optimize networking of representatives of airlines and tourism destinations, and the airports that they serve. Executives of airports and destinations (like The Islands Of The Bahamas) are seated around the table for face to face encounters that allow parties to arrange appointments for meetings of 25 minutes duration, or shorter exploratory “hand shake” meetings of 5 – 8 minutes. At the London conference, the Bahamas Team met with representatives of several airlines from Europe and Latin America that do not presently service The Bahamas. The team also met with existing airline partners. The conference provided a cost effective opportunity for the Bahamas Team to meet with several airline partners in one place – obviating the need to travel to meet with each one individually. Market intelligence garnered at AIRLINE Networking, London, was quite positive: there is a robust, surging consumer demand for travel to The Islands Of The Bahamas. Islands such as Nassau, Eleuthera and Abaco have experienced significant increases in the number of nonstop flights and airline seats over the past year. Exuma is beginning to absorb the impact of a steep increase in airline seats over the past two years. These flights have, for the most part, maintained or seen growth in load factor performance, despite the hefty increases in the number of airline seats. All of this bodes well for Bahamas’ tourism growth in the near term. Minister of State for Grand Bahama Kwasi Thompson has said that the new proposed Carnival Cruise Port, slated for development in East Grand Bahama, was announced to over 11,000 people within the cruise industry during the Seatrade Cruise Global 2019 in Florida, April 8-10, 2019.